- fits H4 style bulbs used in XJs, TJs, YJs, and CJs. Also works with factory headlights in those vehicles. If you want to fit headlights with higher-than-standard-wattage bulbs, you must install the Heavy-Duty Wiring Harness to prevent damage to your factory headlight wiring. The Heavy-Duty Wiring Harness will transfer power directly from your battery to your high-power headlights and will prevent heavy power loads from harming your factory wiring harness. 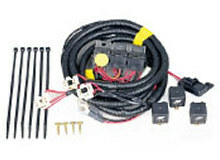 Installation is very simple as the Heavy-Duty Wiring Harness simply plugs into your stock wiring harness' connectors.